Home / Tips and Care / What Are The Most Popular Flowers On Easter? Make someone’s day with eggcellent surprises for their Easter holiday. From unique mixed bouquets and arrangements to gorgeous blooming plants, Open Blooms offers suitable gifts and vase arrangements of flowers for men, women and children. Easter is April 16, 2017 this year and many of us like to to have a beautiful Easter flower arrangement from Open Blooms. Colorful spring blooms are very popular flowers on Easter. However, typically, a lily is given as a single flower. The bulb of the flower represents Jesus Christ’s resurrection. Some consider the white lily symbolic of the divinity and purity of Jesus Christ. This is why many churches decorate with white lilies during Easter, flowers that often are provided by church members. According to legend, the daffodil first appeared in the Garden of Gethsemane and it bloomed during the time of Christ’s resurrection. Daffodils are called Osterglocken (Easter bells) in Germany and are the favored flower for Easter decorations in England, where they are nicknamed Lent lilies. Lily: While the white lily is the traditional Easter flower representing both love and hope, don’t be afraid to branch out this year with more colorful lilies — like the beautifully speckled tiger lily. 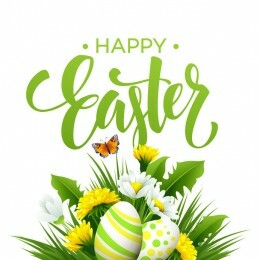 Daffodil: Another popular Easter flower with a romantic connection, giving a bunch of daffodils to another means that you consider that person the only true love in your life. Tulip: This is the Easter flower for lovers, as a tulip is supposed to be a messenger of passion and love. These are a nice accent around walkways or patios. Hyacinth: Purple hyacinths symbolize forgiveness, which seems pretty appropriate considering the religious background of the holiday. They also give off a lovely sweet scent that won’t overwhelm guests. Azalea: Gifting an azalea is said to indicate that you want the recipient to take good care of himself or herself for your sake. Whether or not you’re a fan of the Australian rap/pop sensation who goes by the same name, you’re going to be a fan of these lovelies. These flowers have a range of meaning, from good health to passion. Daisy: Daisies are another popular pick and symbolize purity and purification which fits right in with the significance of Easter. . Chrysanthemum: A white mum is said to represent truthfulness, and the giving of a mum is supposed to indicate that the recipient is precious to you and that you wish him or her greater happiness in life. Represent your holiday cheer on the table with a vase filled with chrysanthemums, some of the most luscious flowers out there. Specifically, white chrysanthemums are said to represent truth. Open Blooms has taken the local flower shop feel and deep understanding of customer needs to a nationwide floral delivery service provider level. With a deep commitment to exceeding customers’ expectation for quality, value and extraordinary service, Open Blooms has served millions of customers nationwide for more than 15 years. Call us today for your Easter Flower needs.